Singing for local retirement villages and care homes. Taking a bow at the Nationals! Busking for charity at Willunga Farmers Market. Performing at civic functions & citizenship ceremonies. 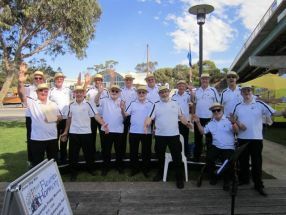 Fleurieu Harmony is a senior male chorus based in Aldinga on the beautiful Fleurieu Peninsula in South Australia, an easy 35 minute drive south of Adelaide and nestled between the mid coast and the vineyards of McLaren Vale. We love singing a cappella four part harmony in Barbershop style and performing for a wide range of groups. We rehearse every Friday morning from 9.30am at the Lifecare Community Hall in Pridham Boulevard opposite the Aldinga Beach Shopping Centre..
Want Fleurieu Harmony to sing at your next function? 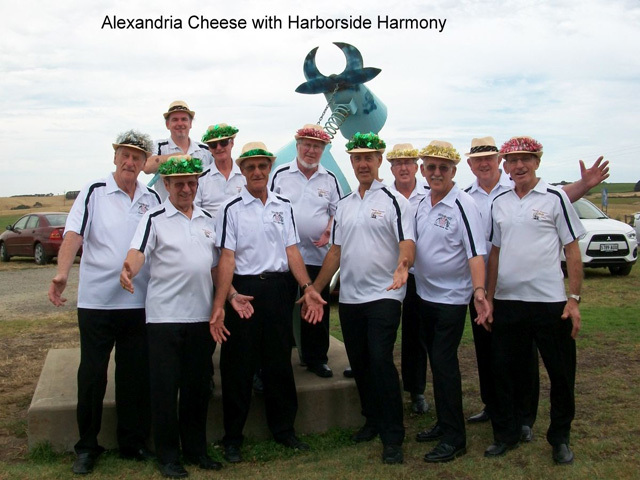 Why not hire Fleurieu Harmony to entertain at your next event? We can perform at corporate functions, charity events, community entertainment events, birthday parties, Christmas parties, awards nights, weddings, engagements, anniversaries, engagements, and even funerals and memorial services.